When we let people die rather than provide safety, we face not a ‘refugee crisis’ but a crisis of values. The arts help define those values which shape the kinds of societies we want to live in. As historians are at pains to point out, the current ‘refugee crisis’ is not without precedent. Though we should be wary of too simplistic historical parallels, ‘lessons from history’ provide an important longer view on contemporary displacement. But we can also look to the history of art and literature for a politics of recognition of the refugee and asylum seeking figures that populate our smartphone and television screens. Stories of exile, migration and forced displacement are abundant in Western literature and art. As ever, Shakespeare provides an ideal starting point: Twelfth Night begins with a shipwreck on the coast of Ilyria (present day Adriatic coast) and with Viola’s words, ‘What country, friends, is this?’ as she comes ashore; Richard II begins with a scene of banishment as Thomas Mowbray and Henry Bolingbroke are sent into exile on the king’s orders; and King Lear’s ‘unaccommodated man’ has formed the basis for many theorisations of the refugee as a figure of ‘bare life’ who exists outside the terms of citizenship and social belonging. In fact, when writing King Lear, Shakespeare was lodging with a Huguenot family in London’s Barbican, so these are not just aesthetic, but also social and political connections. We can, of course, reach even further back to the classical world. Aeschylus’ The Suppliants, written c. 470 BC, is remarkably relevant to today in its narrative of a group of African women who fled forced marriages in Africa to seek asylum and protection in Europe. This was staged in Sicily in 2015. Euripides’ The Trojan Women (415 BC) set in the aftermath of the Trojan war, has also resonated with many struggling to come to terms with displacement as a result of war and conflict. One project, Queens of Syria, which is both a theatre production and documentary, has been especially effective. 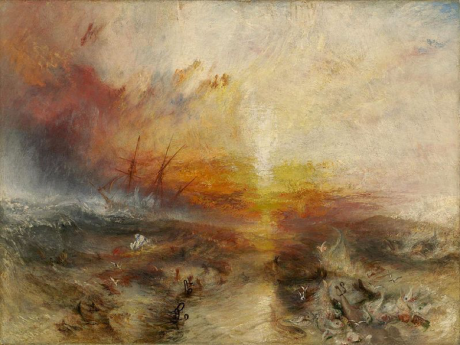 Canonical works of visual art like J. M. Turner’s Slave Ship, which dramatically portrays forced migration in the form of slavery, reminds us of the temporal and spatial connections between the legacies of colonial history and its current forms. Turner’s young patron, John Ruskin, in his write up of the painting, confined to a footnote the fact that the boat in the painting is a slave ship, Zong, and that slaves are being thrown overboard for insurance purposes. So in his framing of the picture, Ruskin leaves out those very connections that the painting aims to evoke. These kinds of omissions happen, too, with current visual imagery of migration and refugees. Images of refugees in camps and on European borders are ubiquitous and often deeply shocking. While they have worked to galvanise certain populations into acts of solidarity – in Britain, for example, protests and responsive organisations dedicated to supporting those in Calais – there’s a longer, more complicated story not always graspable through these fleeting images. It’s a story not just about the experiences of those who have been forcibly displaced but about the kinds of societies receiving them. In a situation where we’re letting people die rather than providing safe passage, we are facing not so much a ‘refugee crisis’, as a crisis of values. How are our values being recalibrated by our daily confrontation with the spectacle of, and sometimes interaction with, people perishing on European shores? The arts have a vital role to play in shaping how we respond to our current age of mass migration. Cultural and creative responses need to sit alongside the work of advocacy groups, political organisations and governments. Not only can the arts offer a counter narrative able to reaffirm the political and social subjectivity of border crossers, they also explore what’s happening outside the journalistic frame; and help shape, critique and deepen our engagement with forced displacement. Telling stories creatively, through literature or film, was one of the principle ways that Britain’s earlier migrant communities went about reflecting, interrogating and celebrating their stories of migration: its benefits as well as its antagonisms. The same can’t be said for refugees. In order to have a legitimate voice with which to speak up, one must first have a legitimate legal status. As long as refugees are languishing in detention centres or makeshift camps outside and inside Europe, often lacking the means of self-expression and public engagement, the conversation will continue to be one-sided. This is one of the reasons we struggle to steer the direction of the conversation away from security fears and threats to resources, and towards the value of being a country that welcomes refugees and migrants of all kinds. Of course, refugees and migrants are adept at finding ways to voice their experiences on their own terms, often to great effect. For example, the organization ‘Freed Voices’ is a group of ‘experts by experience’ who raise awareness about immigration detention in the UK by telling their stories. But the combination of bad journalism and bad law-making means that refugees are often trapped by the polarising opposition between derogatory media depictions on the one hand, and a requirement to testify to authentic experience on the other; to conform to a kind of idealized notion of what it means to be a refugee. The arts can help us think through this binary and provide a more nuanced picture. Take the poetry collective, Bards without Borders, a group of poets from refugee and migrant backgrounds dedicated to exploring the connection between Shakespeare and migration. Globalising Shakespeare in this way casts new light on a figure often seen as relating exclusively to British culture and identity. What art and literature can do more generally – actively, even – is to draw out the intersecting temporalities and territories that constitute our contemporary moment and seek lines of connection between the varying means we have to understand and shape our responses to displacement and migration. The arts allow us a way into social and political questions and the moral and ethical assumptions that underpin them: questions about humanitarianism as political practice and humanism as a set of values. This is what we aim to achieve with our network ‘Responding to Crisis: Forced migration and The Humanities in the Twenty-first Century’. Through a series of international workshops and events, we will create ‘contact zones’ where artists, activists and academics come together and formulate interventionist models of critical and creative work in response to the unfolding ‘crisis’ in contemporary forced migration. Our idea is to develop new modes of collaborative response which draw on the creative energies of cross-sector working. We aim to impact positively on refugees’ lives by deploying the arts and humanities to transform public attitudes and inform policies. On this strand on openDemocracy, you will find contributions from our network participants – activists, academics, practitioners – on topics arising from our collaborative events over the next year. See www.respondingtocrisis.wordpress.com for more up to date details of the project.